An authentically vintage design that accurately captures an era. The s-shaped tonearm works well. Audio quality doesn’t live up to expectations. Bass, in particular, vastly lacking in presence. Crosley is named after Powell Crosley who created a famous radio model in the 1920s. They’ve been specialists in turntables since their first product was released in 1992 when CDs were in their heydey. Let’s see how this one delivers. If you have spent more than a few cursory minutes browsing what is available in the world of turntables, you will have noticed that they fall generally into only a few categories in terms of design: modern reimaginings, ironic callbacks, or actually retro. The latter is where the C100A lands, and this will probably be enough to cause a decent proportion of the potential consumer base to drop off as the looks are anything but fancy. It would be fair to describe this as ‘vintage’, but not in the kitsch sense that is often delivered. This is real vintage. As in it looks no more or less fancy than if it had fallen straight out of the past. If that’s what you’re into, you’ll love it. But if it isn’t, then you won’t. That said, it’s a fairly sleek design and certainly is not bloated in terms of its visual style. What you see is what you get. When it comes to features, turntables in the sub-$200 price range vary quite significantly in terms of how much they prioritize a singular commitment to audio relative to providing a robust set of interesting and innovative features. On the spectrum of available options, Crosley has swung more towards the former than the latter with the C100A which does not boast a huge amount of features worth shouting about. With that in mind, we do have an adjustable pitch control which makes use of a strobe light being shone onto the platter dots in order to fine tune albums which tend to tweak high or low so that each note sounds as good (and as accurate) as it was intended to. An s-shaped tonearm with a diamond tip needle (from Audio Technica) picked up every detail of the cut whilst ensuring that skating is kept to an absolute minimum so that the sound quality is preserved. 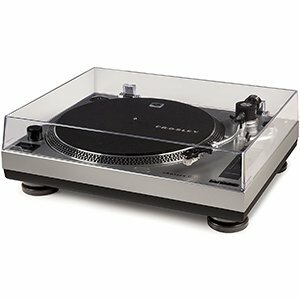 Lastly, a built in preamp means that this turntable is ready to go out of the box and can connect to powered speakers via an RCA output. So, given that they have not offered a whole lot in the way of additional features and exciting extras, how does the C100A perform in our tests? Well, on the whole we were a tiny bit disappointed. It’s not that the sound is bad, it’s just that it isn’t necessarily good enough to warrant the lack of options which this device has relative to others at a similar price range. The audio is decent, but definitely comes across as thin and lacking in presence. Especially in the bass which, while fairly standard fare for a turntable, was more noticeable in this model than in most that we have dealt with during our tests. Even when hooked up to a preamp and a set of speakers, the overall quality left a lot to be desired. Which is unfortunate, but often the way with these things. Whilst sporting a design that is accurately vintage and very much a no nonsense, no frills affair, the spartan feature list puts a lot of pressure on the audio to deliver. And, for the most part, it does not succeed.